ORMOND BEACH — The condominiums at the Ormond Renaissance would put any retirement home to shame. The clubhouse — the only building constructed to date — offers a glimpse into what residents might expect: vaulted ceilings, stainless steel appliances, arched multi-paned windows and ceramic floors inlaid with hardwood. The exterior of the 10-building complex under construction on Sterthaus Drive will be Spanish Revival style and the amenities promised are plenty. But there’s a catch: No one under the age of 55 will live there. In an attempt to cater to a growing population that includes an increasing number of retirees relocating to the Daytona Beach area from other parts of the country, several local builders are developing communities designed strictly for those 55 and older. Florida has always been a magnet for retirees, but the model pioneered at The Villages, the massive 55-and-older megacity in Sumter County, is taking hold locally in smaller forms. 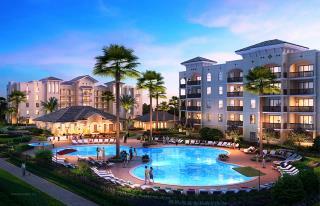 The 280-unit Ormond Renaissance is one of three new 55-and-older communities under construction in Volusia County. Each offers a different experience. The 6,600-home Latitude Margaritaville Daytona Beach community now going up in Daytona Beach drew national attention when its developers announced plans early last year to create the first-ever Jimmy Buffett-themed active adult community based on the singer-songwriter’s music touting the laidback carefree lifestyle of living in the tropics. The first residents moved in to the community’s first phase on the north side of LPGA Boulevard, just west of Interstate 95, in March. A few miles to the north, on the east side of I-95, across from Destination Daytona, another large 55-and-older community is taking shape: the 1,577-home Plantation Oaks, which will include deluxe manufactured homes in a gated golf cart-friendly environment. Ormond Renaissance’s niche is luxury and convenience, located just one block east of Ormond Beach’s The Trails Shopping Center, said Sheriff Guindi, an agent with Realty Pros Assured and the sales manager for the so-called active adult community. Prices for condo units range from $265,000 to $382,000. The project initially started out with no age restrictions. Guindi said so many interested buyers wanted to know if the condos were exclusive to people over 55 so the developers adjusted their plans. They have 21 reservations to date and 13 have been converted to contracts, which require an initial 10 percent deposit and two 5 percent installments as the project progresses. Developer Buddy LeCour last year told The News-Journal that he expected the first 28-unit condo building would be completed by March of this year. Today, only the clubhouse has been built. Guindi said the delay in construction was because of architectural changes as well as the decision to add an on-site fitness center. Guindi said the first residential building now is expected to be completed in August. Construction of the rest of the project will be driven by sales demand. The demand for 55-and-older communities is being driven by the area’s growing population. In the last decade and a half, Volusia and Flagler counties have seen the number of residents ages 60 and older grow by 49 percent, according to data from the American Community Survey. The number of Floridians — now at 20 million — is expected to somersault to 26 million by 2030. A sizable portion of the new residents will be cash-rich seniors. “I think the income of the 55-and-older is higher when they retire so they’re buying houses here,” said Debbie Callahan, president of the Daytona Beach Area Association of Realtors and an agent with Adams Cameron & Co. Realtors. Due to a mix of factors, including lower housing prices and abundant health care availability, the Daytona Beach area was named last year as the 7th best place to retire in the country by US News and World Report. Not everyone will be able to afford the swank accommodations at the Ormond Renaissance or Latitude Margaritaville, where homes start in the low $200,000s. That’s where the developers of Plantation Oaks believe their mark is, said Doug Kamm, sales director for that project. The community is offering homes that are a cut above garden variety manufactured dwellings. They can be as large as 2,900 square feet and come with a porch and two-car garage. Plantation Oaks, which built a similar community in Flagler County years ago, is going after the budget-conscious consumer with prices starting around $150,000. Kamm said they have about 50 people on the waitlist and will begin sales after the model homes, now under construction with a 10,000-square-foot clubhouse, are complete. The first 97 spaces will be done in the next three months. Interest has been steady, he said.